Or fine, bury it in your drawer. In a perfect world, we’d never need eyelash curlers. We’d all have full and fluttery lashes that would require zero lengthening and absolutely no mascara. I have met a ton of women who don’t own lash curlers, simply because they are terrified of using them. (I totally understand, because they do look like medieval torture devices.) I’ve also heard a lot of lash curler horror stories, most of which were about losing a big chunk (if not all) lashes. Yikes. But the beauty gods decided to invent the thing that is Benefit's Roller Lash—magical mascara that lengthens, curls, and separates hair (so you don't get those awful chunks of product on your lashes) instantly! How does it work? Well, the brush has these tiny hooks that lift and curl all (as in, all!) your lashes from the root up. That, and the formula also contains Provitamin B5 and Serine that will help condition your lashes, so they don't break easily. But does it really work? YES. YES. YES. The mascara has fantastic staying power. It really opened my peepers, giving me younger-looking and less-tired eyes. Which is a big deal, because I am the girl with lashes that NEVER curl. JSYK. So should you get it? Totally. Especially if you've never owned an eyelash curler because you are terrified of it. Also, if you do actually own an eyelash curler, but don't know how to use it. 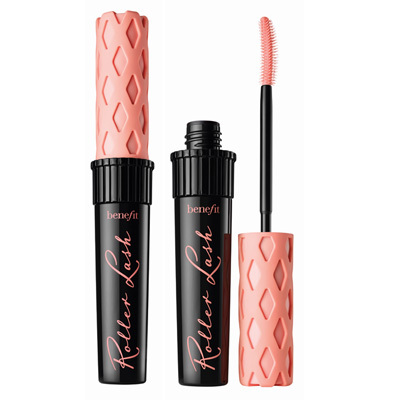 The wonderful people at Benefit Philippines also suggested that you can use the Roller Lash before applying regular mascara to give your lashes extra, extra volume. The Roller Lash isn't available in Benefit stores until March 4 though, so in the meantime, y'all can just read this!